All right, maybe I hyped that up a little bit. But I do have a secret—one that I’ve been carrying around for the last two years. That is, until I recently learned that it’s far less a secret than I thought. Oh, how these paper thin walls of graduate school spread gossip! What does keeping a secret do to you personally? In a series of four studies, researchers had participants bring to mind a “meaningful” or “small” personal secret. Afterward, researchers had participants do different tasks. In one study, for example, after participants recalled their secret (either the meaningful or the small one), researchers showed the participants pictures of a hill they were supposedly going to have to walk up later and asked them to estimated how steep it was. Another study had participants recall one of the two types of secrets and then play a beanbag toss game. That is, a target was placed on the ground about 9 feet away and participants were told to throw the beanbag as close to the mark as possible. In the final two studies, researchers looked at two specific populations of people: romantic partners who had been unfaithful and homosexual individuals. Here, the researchers found that the adulterers who thought a lot about their infidelity and the homosexual individuals who were told to “hide” their sexual orientation both rated a variety of objects as much heavier than their matched, comparison group. 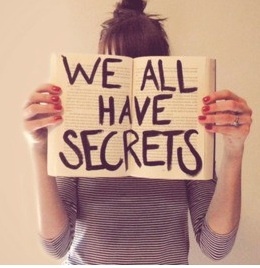 So can you figure out what keeping secrets do to us? Just as we say we “feel” burdened by secrets, it seems that they do in fact burden us. That is, at least concerning cognitive perception, keeping a secret makes us feel heavier such that the effort to walk up a hill, the distance between us and the beanbag target, and the weight of objects all seem greater. Now, as for my own secret…I think having my whole department know what it is should be enough to alleviate that added burden from my chest. Though now your desire to know what it is might have added a burden to yourself. Slepian, M. L., Masicampo, E. J., Toosi, N. R., & Ambady, N. (2012). The physical burdens of secrecy. Journal of Experimental Psychology: General,141(4), 619. If what say is true, that holding secrets cause us burden and a may warp our cognitive perception, and I believe we all keep a “treasure trove” of secrets, than our realities are not true to form, they are just perceptions of what is “real”. Or am I the only one with this treasure trove? Oh no, we all have these treasure troves 🙂 However, just as you alluded to this “relativism” in cognitive perception, so does this perceiver’s bias extend to one’s own secrets. That is, some people may view their secrets as “weightier” than others would view them. Similarly, even though we all may carry these secrets in the background of our awareness, unless they’re made salient (like is done in these studies by making the participant write about their secrets), they won’t have this effect. So even if you have those secrets, thinking about them, or bringing them to your conscious awareness, is what will “warp” your cognitive perception. Secret secrets are no fun.